The production plasma system TETRA-100-LF-PC with 100 litres chamber volume and PC-control is used in the production for cleaning, etching and activation. Plasma system TETRA-100-LF-PC for cleaning, activation and etching in production. 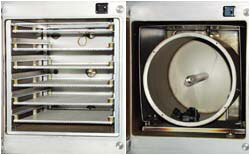 Sixfold tray and rotary drum for TETRA plasma systems.